VitoLax™ is your herbal answer that contains unique laxative herbs, that relieves you of constipation fast, regularizes and normalizes bowel movements and promotes a healthy digestion. Constipation is usually said to occur when bowel movements are restricted to 3 or lesser times a week, or when the stool is hard, dry, painful and difficult to pass. The food we consume, the physical activity we engage in all have a rather direct effect on constipation. At times, the constipation gets a little more serious leading to piles and fissures. What makes VitoLax™ an increasingly preferred option when it comes to overcoming constipation? As compared to synthetic drugs, VitoLax™ is a balanced combination of the most potent herbs that naturally regularize bowel movements. It is non-lethal, does not contain traces of chemicals, rather its prime function is acting as naturally hydrating and bulking agent, to ensure regular and soft bowel movements. VitoLax™ also rules out side effects like nausea, diarrhea, cramps as seen in other medications. Moreover, being in a powder form, it is easily digested and absorbed. VitoLax™ acts as a bulk forming laxative adding bulk and water to your stools. It contracts and triggers the bowels to pass stool out easily. It has incredible laxative qualities that enable proper and smooth bowel movements. 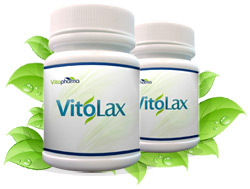 VitoLax™ is made of pure and natural herbs; it assures complete safety and is absolutely free of side effects.